This release will add enhancements to the Licence Master Client API that allow integrated applications to detect (and optionally tolerate) service outages and other conditions that prevent communication with the licence server. Over the last 10 weeks we have been looking for our final 2 speakers for DotNetNuke World. After thousands of votes I am happy to say that we can now finalize our speaker lineup. We had a diverse range of sessions and speakers that participated. Speakers represented both Europe and North America and covered topics ranging from voice-enabling DNN apps to developing social modules for DotNetNuke. In the end the community selected two speakers and sessions above all others. I’m Not the “Super Fan”, but I am a Fan! Earlier this summer Will Strohl announced the DotNetNuke Super Fan Contest for 2012. I love our community and how passionate they are about DotNetNuke. I was really excited last year to see some of the great Super Fan entries. This year I wanted to participate even if I couldn’t “officially” enter. 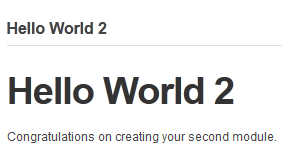 In part 3 of this series on DotNetNuke Module Development we created our first module “Hello World”. In this blog I will describe a second way that you can create modules. The next method we will use is to create the same User Control (ascx file) in a simple IDE like WebMatrix. WebMatrix is a free download from Microsoft, so is an excellent choice for novice or hobby developers who are just starting out on DotNetNuke development. Back in April I started a series of blog posts on DotNetNuke Module Development. So far we haven’t actually done any development, so in this blog post we will create our first module, and in the long-held tradition of software development - lets call it Hello World.